I am always searching for activities and crafts for the kids to complete on their own so I was extremely excited to learn about a new line by Manhattan Toy! Manhattan Toy is launching a series of 28 arts & crafts, do-it-yourself, role-play and puppet kits as well as exciting games as part of their brand new “Imagine I CAN” series. My two boys each received an activity kit and I also received the finger painting kit so I could create a painting with my 6 month old daughter! My 7 year old son loves to color and loves dogs so the Imagine I Can Create & Color Puppy kit was the perfect fit for him! With this kit there are 5 markers, two sheets with the pieces that pop out so you can build the dog, and the inside of the box can be colored to create a scene! I suggest using scissors to cut out the box scene as I tried to rip the box open and I didn’t rip it properly so it was frayed. The scene still works just fine though and he loved coloring it and writing “Spot” on the dog dish! My son had a lot of fun coloring the dog with the markers, he decided that he wanted to color the pieces while they were still on the sheet and then pop them out when he was ready to put them together. I agreed that it was best for him to do that so my floor could stay marker free! All of the pieces are number so it is easy to match the numbers to assemble to dog – here is his Spot! He was so proud of himself for creating this cute little dog! It is truly a fun activity for kids to do on their own and it is rewarding for them when they see the final project put together. For only $6 per kit, these would make great gifts for all occasions and even a great birthday party craft for the kids to do too! My 2 year old son is my little builder. He loves to make towers and stack items on top of each other to watch them fall over – the Imagine I Can Shape Stack is absolutely the right game for him! He may not understand the concept of the game but he did tell me that there was a red shape, yellow shape, blue shape and laughed when he saw his tower fall over. The object of the game is to roll the die and add the color that it lands on to the stacking piece. You keep taking turns until someone knocks the stack over. It is a really fun game for little ones, especially those that love to build like my little guy! 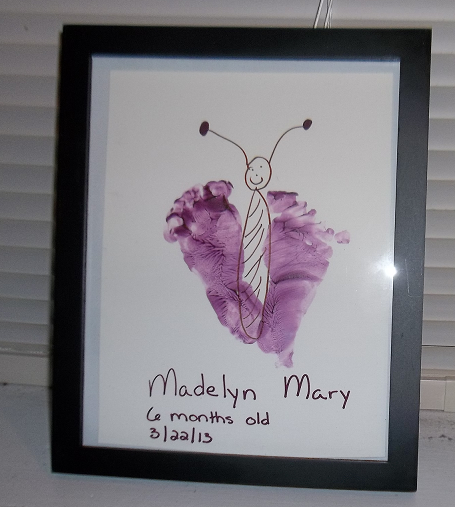 I have been searching for a way to capture my baby girl’s little tiny feet and I saw on Facebook a while ago a picture of a butterfly made with baby feet. I just had to create my own version and the Imagine I Can Finger Paint Fun kit made it so easy!! I used the green too and mixed the blue and red paints together to make purple. I don’t have any pictures of the process because my husband and I were both holding on to her and trying to keep her little legs and feet still! The paints come in re-sealable containers and are safe for kids to use. I am still trying to work up the courage to let my 2 year old create me a finger painting. Have I told you that I am not the craftiest person!? I still love it and have framed it so we can remember how tiny her little feet were. There are so many other creations that kids can make with this fun finger painting kit, I may let the boys have at it and create the next Picasso painting for me! 🙂 The Finger Painting Kit includes: 4 washable paint containers, 3 plastic stampers and 3 plastic scrappers. Overall, we absolutely had a lot of fun with the three items we received from the Imagine I Can series by Manhattan Toy. Head over to Manhattan Toy to purchase any of these fun items! Follow Manhattan Toy on Facebook and Twitter! Enter to win a kit of your choice from the Manhattan Toy “Imagine I Can Series.” Enter below on the Rafflecopter form. Open to US only, ages 18+. Void where prohibited. Disclaimer: We received the above items for free to facilitate this review. This in no way affects our opinions. oh I would love the Imagine I Can Pirate Treasures! Love the Imagine I Can Pirate Treasures!! My daughter would love the Imagine I Can Finger Paint Fun. I’d get either the Imagine I Can Fairy Enchanted or the Imagine I Can Feel Better MD. Dd would love either of them! My grandsons would like the Imagine I Can Feel Better MD.